Store at room temperature. Adequate ventilation. Protect from light. 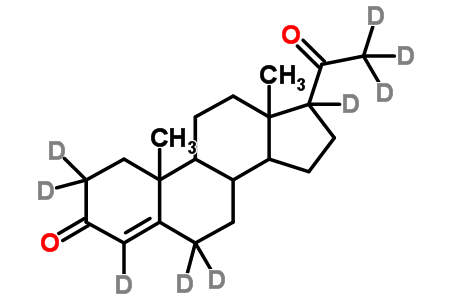 Baulieu E, Schumacher M., Progesterone as a neuroactive neurosteroid, with special reference to the effect of progesterone on myelination. Steroids, 2000, 65 (10-11): 605–12. ; Patel, B.; Elguero, S.; Thakore, S.; Dahoud, W.; Bedaiwy, M.; Mesiano, S., Role of nuclear progesterone receptor isoforms in uterine pathophysiology. Human Reproduction Update, 2014, 21 (2): 155–173. ; Campagnoli, Carlo; Clavel-Chapelon, Françoise; Kaaks, Rudolf; Peris, Clementina; Berrino, Franco, Progestins and progesterone in hormone replacement therapy and the risk of breast cancer. The Journal of Steroid Biochemistry and Molecular Biology, 2005, 96 (2): 95–108. Applications: A labeled endogenous steroid. Involved in pregnancy, the menstrual cycle, and embryogenesis. An important metabolic intermediate in the production of other endogenous steroids. Also functions as a neurosteroid.